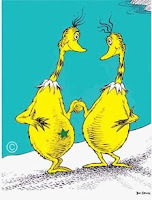 not only is "the sneetches" one of my favorite books of all time, i think it is appropriate for what i am going to write about today. very rarely is tiddy serious, but something happened yesterday that really caused me to reflect and i would like to share it with you. here at the ferguson household, we receive visits from mormon missionaries from time to time. yesterday, i was blogging on my couch and chilling with mr. nacho when i saw two young men walk up my sidewalk. nacho started going nuts! i was SO annoyed and ready to shoo the guys away (as usual) when something made me stop and listen to what they had to say. i don't know a ton about the mormon religion, but what i do know is that the young men must take TWO YEARS out of their lives, travel around the country, and basically knock on doors and spread the word about the church of latter day saints. can you imagine that? it really makes me wonder how many doors are slammed in their faces, how many people cuss them out and how they can continue to get out of bed every day and keep on going. not to get on a religious rant, but aside from really feeling empathy for these guys, i learned something yesterday. tiddy was raised presbyterian. mister ferguson is catholic. we've never had more than a one minute conversation about that because we know we share the same basic belief, no matter what name you call it. anyway, back to the mormons. after patiently listening to what they had to say, i asked "what is the goal of your visit? is it to preach the word of God, or convert me to the mormon religion?" they said that it was to get me to read the book of mormon. i thought that was interesting and asked them why they felt what THEY believed was better than what i was raised to believe? who is right and who is wrong? is there an answer to that question? if i turned the tables on them and started preaching about the presbyterian religion, would they be open minded? they said no. so why would they expect me to be? my point is this. no matter what church you belong to, no matter if you have a star on your tiny belly or an enormous gut with nothing on it, we're all just people trying to make it out here in this crazy world. and if i hadn't taken the time to talk with those guys yesterday, i would have screamed at them to get off of my porch and walked back inside thinking i was the best kind of sneetch. but i'm not. i'm just a girl that lives in pittsburgh who loves to laugh and drink and think that somewhere out there, somebody will read this and take something away from it. Godd stuff TF! Although I like to picture my Jesus in a tuxedo t-shirt, cuz it says, Hey I'm formal, but I like to party. You need to get all hopped up on some of that Yellow Tail Boxed Wine for your next blogging experience!